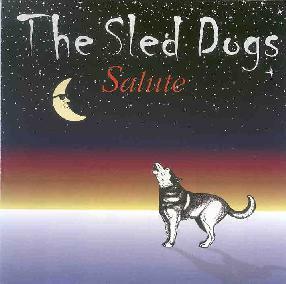 The Sled Dogs - "Salute"
From the onset The Sled Dogs deliver nine songs that appear to honestly recreate the mood of the prog-folk of the early to mid 70's. The sounds evoked by The Sled Dogs definitely nod to the groups covered by them, in several ways. This is partly why there may not be much interest found in The Sled Dogs' first release. It appears that The Sled Dogs are trying to recreate the dramatic prog/folk-rock paved by earlier British groups like Rush and The Moody Blues, to name a couple. Despite the redundant mood of the CD, there were two tracks that did capture the better essence of one of their predecessors' work and compare to more contemporary work: "No Sun" and "The Stream." "No Sun" seems to have a similar tone as The Moody Blues' "Legend Of A Mind" and some shades of a contemporary neo-prog outfit Star People. Admittedly, "The Stream" does well for The Sled Dogs release as it comes off as one of the better tracks on the disc. "The Stream" follows it, in rather good taste. In all, the unfortunate quality about this entire release is that it does not seem to capture its own voice. It rather lives through the voices of the past instead. It can be said that a group like The Sled Dogs prefer mastering chords, notes or the songs of former art-rock groups instead of etching out their own distinct perspective. The upside to this is that people may attest to the group's talent to play music but what does it say about the group artistically? Furthermore, one would have to actually question whether the overall content on this CD is something that captured a very strong following at the height of its creation. To profit in the world of capitalism or to be an accomplished artist, you cannot only be a good player of instruments but also one that does not overwhelm the human senses with too many musical clichés and covers of former successes. For more information you can visit The Sled Dogs web site at: http://www.thesleddogs.com. Contact via snail mail c/o The Sled Dogs; 301 ½ South Fourth Street; Mount Horeb, WI 53572. Email The Sled Dogs at: sleddogs@thesleddogs.com.